After its initial 11 years of primary research, MECLABS began offering to partner with key companies such as The New York Times, PR Newswire, The Boston Globe and 1-800-FLOWERS.com to further test its discoveries and to help these companies achieve remarkable results. Like other institutions, MECLABS forms partnerships in the private sector that dramatically intensify our discoveries and, at the same time, drive up the revenue performance of our Research Partners. One of the most important ways the Institute’s discoveries are validated is to field test them in the corporate environment. To that end, MECLABS has established a rigorous research program with key corporate partners. MECLABS has been involved in these direct Research Partnerships with companies throughout Europe and North America since 2001. 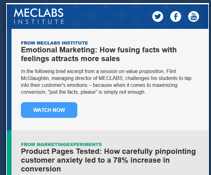 These tests have helped us create and validate a methodology to discover why Research Partners’ customers say “yes.” Your company can receive custom research from MECLABS analysts based on this methodology to optimize its value proposition and messaging by becoming a Research Partner. However, as an institution, we want to go beyond solving your problem. We want to help empower your team to solve these problems on their own. We will teach you our repeatable methodologies while our teams work together, and in so doing, work with your organization to increase its capacity. Major companies often combine several of our groups in order to design a custom solution. You likely invest significant resources in driving traffic to your site. We'll help you close more business using the cognitive psychology of conversion. Our creative is driven by a scientific focus on optimizing every facet to generate results for you. Data Sciences performs data analysis to help you gain top takeaways from your data and inform experimentation and ensures all experimentation is scientifically valid. To learn how MECLABS can help you, read more about our Research Partnerhips and provide contact information in the form below. A MECLABS analyst will reach out to you with details on how a Partnership can reveal what your customers really want. We'll ask a few questions about your business to determine how we can best serve you. This includes immediately providing valuable content, at no charge, that addresses your specific challenges. Explore how MECLABS research can help you achieve your goals. In this case study, Peter Doucette shares how The Boston Globe is optimizing its entire business.